So I decided creating puppets from scratch using Koolmoves was the way forward from there. 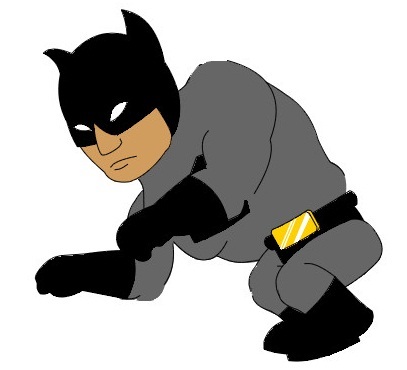 The video below is my first test animation of the technique using my Bat Storm character. It's not strictly a Koolmoves tutorial however I do take some time to demonstrate how my Bat Storm puppet is constructed and how I simply moved the body parts around to create a looped jumping sequence. The final sequence looks a lot more natural (in my opinion) than some of GoAnimates prebuilt Comedy World Character actions and opens up the possibility for making Bat Storm episodes with much more action. Note: apologies for the jerky stop start nature of the video in places below. My screen capture software was really struggling for some reason and wouldn't even record my narration without distorting my voice awfully - hence the lack of narration and substituted music track. Woah. Amazing! I must try this one of this days. Your creativity wowed me. LOL. Too bad your audio is kind of weak. Please do post more of this.